Harrah’s is apparently trying to corner the market on the “All You Can” Vegas experience. Since the last time we were out they appear to have added a deal that includes all the shows you can watch and all the clubs you can handle, but the one we took advantage of was the Buffet of Buffets. After 10 minutes of signing up for Harrah’s rewards program, we were able to get the buffet deal for $44.99 each. Signing up for the card has the added advantage in that the card becomes your buffet pass, instead of having to wear a plastic bracelet for 24 hours. For our first buffet, we went to the Rio, which in times past was our favorite buffet, where we have at times spent more than $45 just for that buffet alone. Alas, the lowering of the price seems to have taken it’s toll on our beloved buffet. 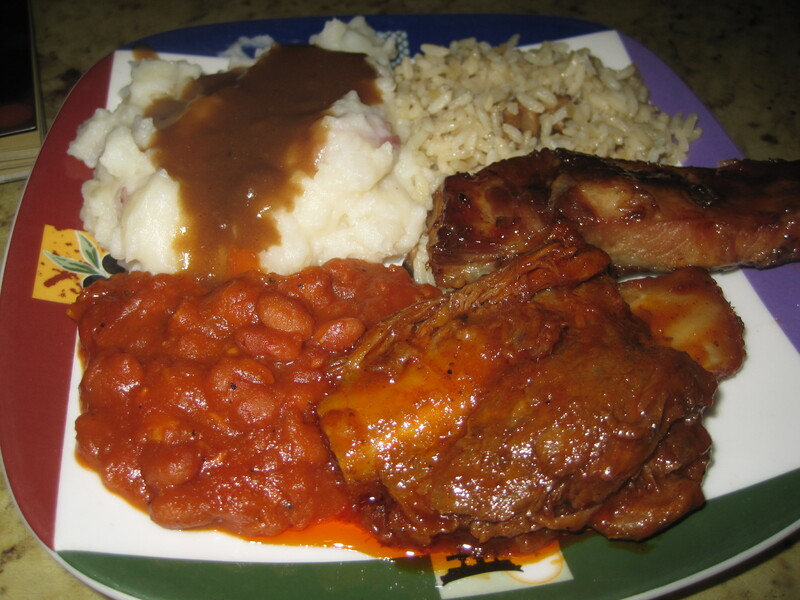 Although Rio still has a multicultural station theme going on, with each section of the buffet representing a different type of cuisine, most of it was not very appetizing looking. The simple food was okay – BBQ, burgers, and shrimp were all passable, but not much better than what you’d expect to get at a Sizzler. 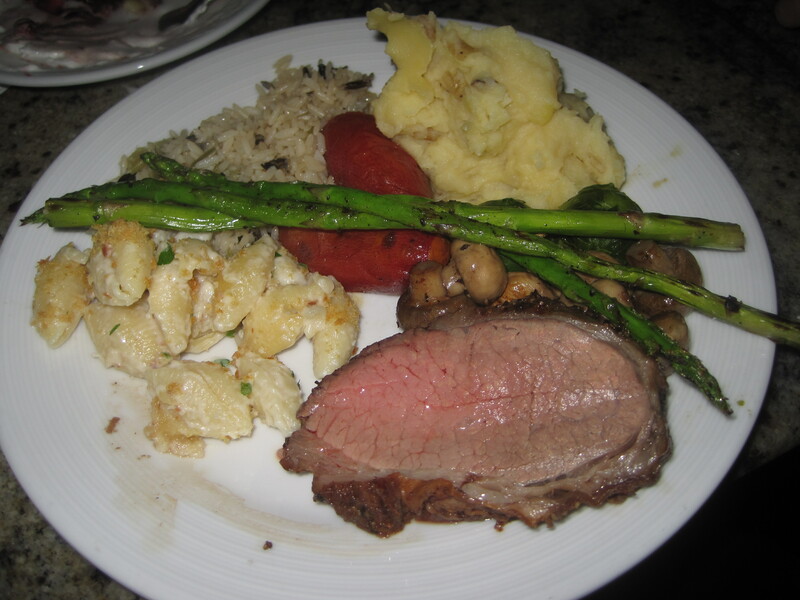 The roast beef was downright tough and inedible. 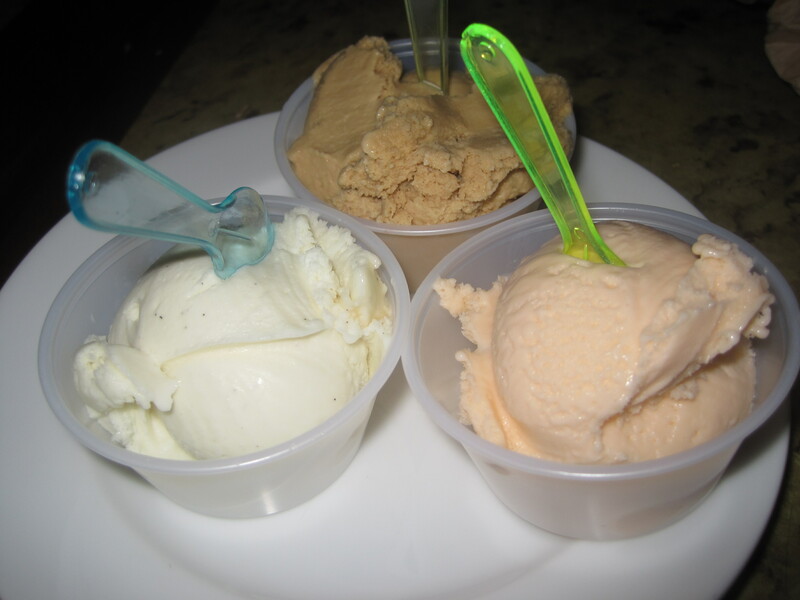 Luckily their awesome gelato bar was there to save the day. Was it worth the approximately $10 to $15 we paid to get in the door? Sure, but just barely. I thought that, but then later that day we hit Lago at Caesar’s Palace for dinner. Thanks to a certain famous comedy, Caesar’s is now the most famous hotel on the strip, so I expect good things from them. Several good reviews of Lago on Yelp pushed the bar up even further. I was not disappointed. Lago was the antithesis of our experience at Rio. Unlike Rio the selection is very small, but what it lacks in variety, it more than makes up in quality. Everything we got was terrific, and the attention to detail was really neat. Salads and fruit came in little glass cups, which, besides being cute, kept the line moving nicely. My plate of prime rib, snow crab legs, and sweet potatoes would have been worth dropping $15 by itself. In fact, we loved the food so much, I didn’t even get any pictures. 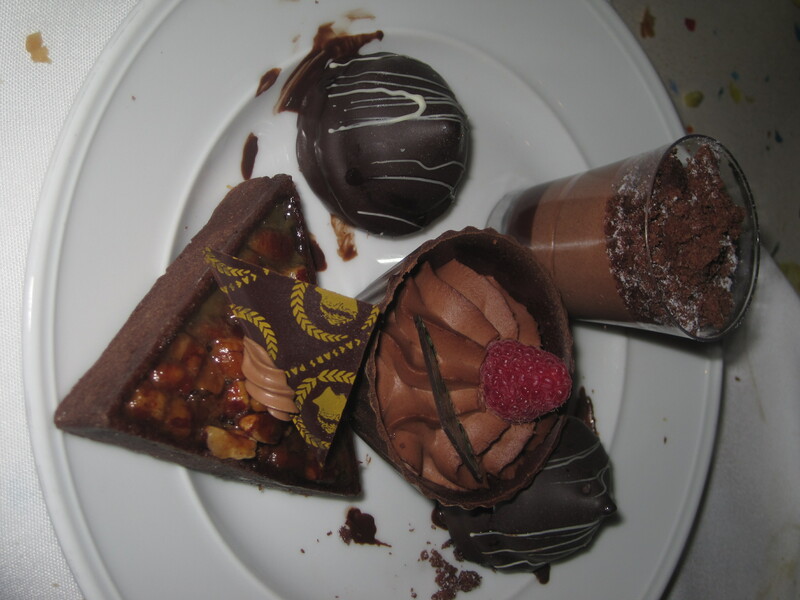 But that’s okay, because where Lago really shines is its desserts. They are tiny, they are ADORABLE, and they are DIVINE. Seriously, you have to eat them to understand. The Oreos covered in chocolate ganache and dipped in more chocolate? Insane. 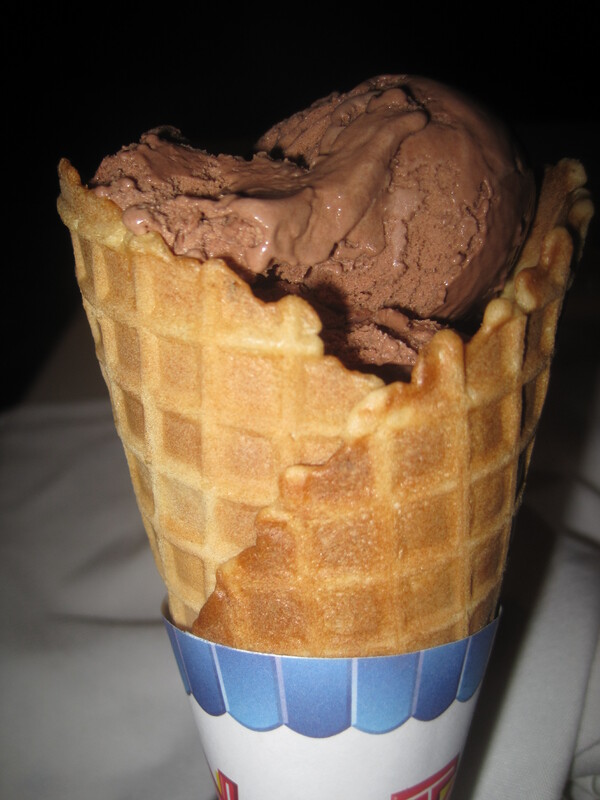 And the gelato even comes in a waffle cone. The little mini lemon meringue was light and brilliant. It’s completely nuts.I would go to Lago just for the desserts. 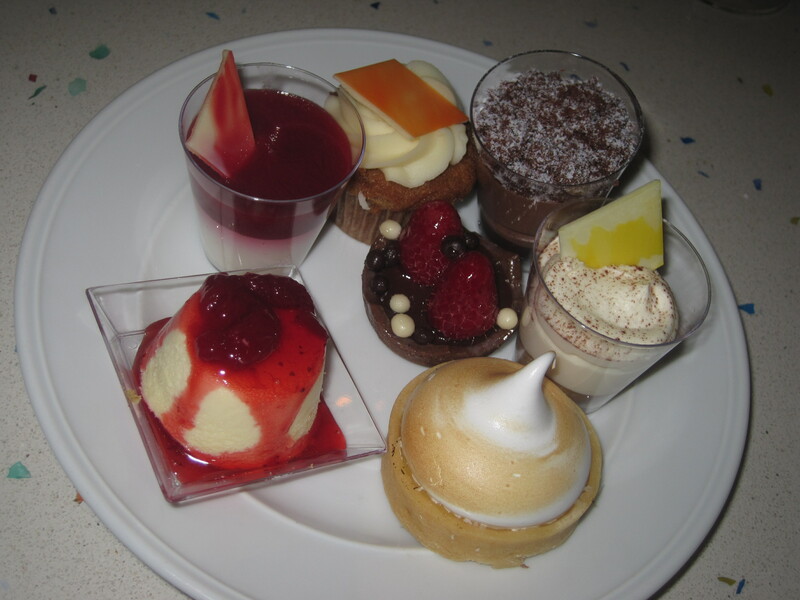 So many tiny desserts! And they were all heavenly! Calories? Diabetes? LALALALALALALALA I can't hear you! Now this is food. Good food. So yum. 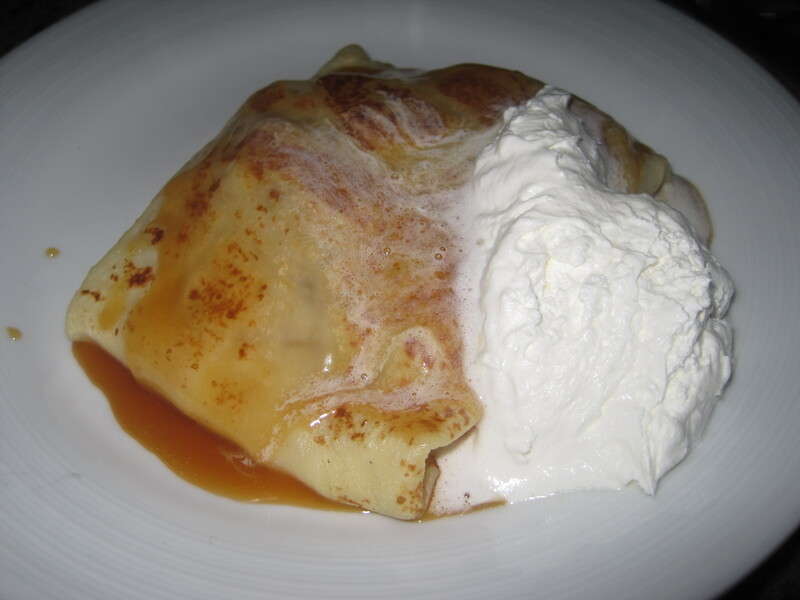 Caramel apple crepe with fresh whipped cream. Apple pie has got NOTHING on this. Other buffets available are the ones at Planet Hollywood (was unimpressed the last time we went, but it has good reviews on Yelp), Imperial Palace, Harrah’s (naturally), and the Flamingo.